Today we had to have our sweet bunny Aafje put to sleep. I met her in a garden center in early 2006. She was a little toddlerbunny accompanied by some siblings. She was the liveliest amongst them. I fell head over heels in love but decided to be responsible and NOT bring her home with me. I walked away. And then turned around for one more look. At that moment, she jumped and made a sort of spin in the air. She had me. And I brought her home and she had me, Maarten and our cat Indi. I named her Aphrodite Ana. Aafje had a zest for life; exploring, stating her opinion (by growling), demanding, fighting with the cat (when Indi was still alive) over our attention, cuddling and giving us an endless amount of bunnykisses and love. And that's how she was untill the very last moment. For the first five years that she was with us, I was mostly housebound because of my health. My world was very small and that situation (combined with our personalities) made for a tight bond between Aafje and me. Last june I discovered a lump in her belly and she was diagnosed with breast cancer. I feared she would have only one or two more weeks to live and was very reluctant to leave her for many weeks. When I couldn't keep up being at home with her all the time I made sure to spend as much time with her as possible and have Maarten or Wilma keep her company when I had to leave for more than a couple of hours. 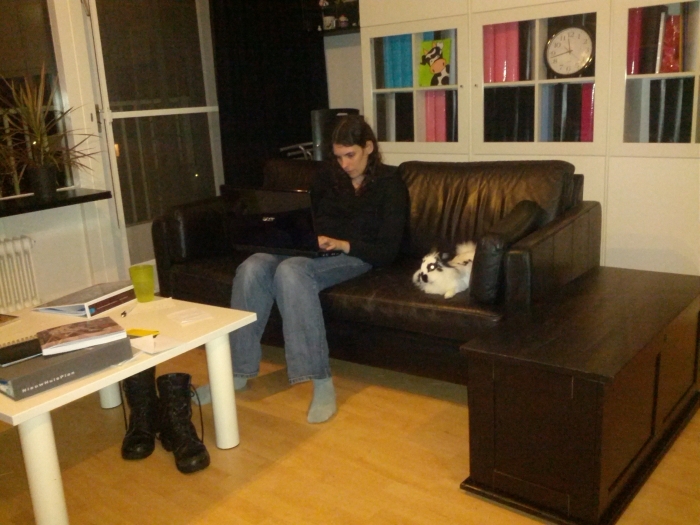 She was allowed to roam free in the livingroom 24/7, instead of most of the day like it used to be. Often when we would check in on her when we woke up at night, she would be sleeping on the couch. She felt reasonably well for a long time, and seemed to have enough quality of life whilst the tumor grew slowly but surely. We enjoyed each others company more than ever. The past two weeks her situation deteriorated, although she was still a happy bunny, and this morning it had gotten so bad that it was time to make a decision. We have been so lucky to have her in our life. This is how we spent most of our evenings, me on the couch with the laptop, she lying next to me, or sitting next to me demanding to be petted. First thing every morning Maarten would give her a carrot. When I was cooking dinner she would get the second one. I would call her and she would come to collect it, and then take it with her into the livingroom. wat een mooi stukje, jullie helemaal, maar wij ook, gaan haar missen.. sterkte!